You'll be £8.00 closer to your next £10.00 credit when you purchase Dickens and Christmas. What's this? In Victorian Britain, the celebration of Christmas lasted for 12 days, ending on 6 January, or Twelfth Night. Through Dickens and Christmas, readers will come to know what it would have been like to celebrate Christmas in 1812, the year in which Dickens was born. They will journey through the Christmases Dickens enjoyed as a child and a young adult, through to the ways in which he and his family celebrated the festive season at the height of his fame. It also explores the ways in which his works have gone on to influence how the festive season is celebrated around the globe. An insight into how Christmas was celebrated throughout the 19th Century and how the writings of Dickens have influenced how Christmas is celebrated today around the world. A great book to read during Christmas time. Packed full of information and details for Dickens fans. Christmas is Dickens as much as Dickens is Christmas. A Christmas Carol has been a been a part of my life since I was small. I never knew it was a book, until I was much older, for years it was the movie that my Dad watched over and over during the lead up to Christmas. For me, Charles Dickens will always be a part of Christmas, and multiple versions of A Christmas Carol still show up on my television to this day. However, I had no clue just how much the story influenced how we celebrate the holiday. Until this short little novel came to be, Christmas was a much different creature in England and definitely in the United States. This book gives you some of that background and you'll likely be shocked at just what Dickens and his work influenced in how you celebrate today. I want a copy of this for my history shelves, I just wish it had been longer. This is a fascinating historical document, quite apart from what it tells us about Dickens and his family, as Hawksley uses articles from the day, excerpts from Dickens’ work, and reviews of his work to give a great authenticity to this study. Reading about the author of such iconic stories is a must for any fan. The history behind the stories and his life as well, the beginning of Christmas as we know of it, is a fascinating insight of life in Victorian England at the time. A very good overview of Dickens in terms of bio and contemporary goings-on during his writing of his Xmas tales. Unlike many books, its focus lies on ALL of his Christmas stories, not just A Christmas Carol, so it provides a broader depth and introspection on what Dickens attempted to do with his fictions both at that moment of writing/publishing but also over the course of his career/lifetime. Excellent read. I enjoyed this book it was well written and a joy to read. The authors gives insight to the subject matter that I felt was compelling and would recommend this book to a friend. Lucinda Hawksley presents the reader with the social history of Christmas along side the personal history of Charles Dickens. The book explains where many of our modern festive traditions originated from and we also learn where Dickens' inspiration for many of his festive tales came from too. This book would make an ideal Christmas gift for a loved one who loves Christmas and Charles Dickens. There is much here to take forward and keep in our hearts - traditions born in the Victorian era when, thanks to Dickens and Prince Albert's German influence, Christmas was more fashionable than it had ever been still resonate today. But perhaps the most important thing the reader can take from Dickens and Christmas is the message Dickens himself conveyed in his festive writings - one which is incredibly timely and has never been more urgent. And that is simply to think of those less fortunate than ourselves - all year, not just at Christmas. Now we couldn't celebrate Christmas without Charles Dickens, could we? Lucinda Hawksley, a direct descendant of Charles and Catherine Dickens, thankfully thinks not and has penned this timely exploration of the 19th-century phenomenon that became the Christmas we know and love today - and her 3x great-grandfather's influence on how it is celebrated across the globe. I knew I was going to love this book before I even started reading. And I wasn't disappointed. 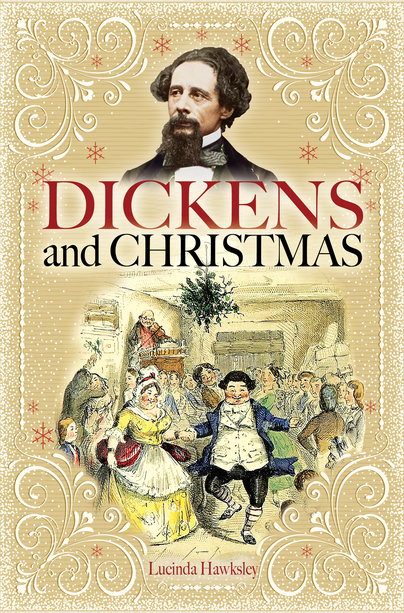 This book is a wonderful mix of information about Dickens' life, Christmas traditions in his lifetime, and impressions of the holiday from his personal writings and novels. It also includes snippets from newspaper articles from the time, biographical information from family letters and his daughter's book. Everything from Twelfth Night cakes to house parties. :) I understand much more about how Dickens' rough childhood, his life experiences and his anger at how the poor were treated colored his writing, but yet made him love the Christmas season. And he made others love it, too. I read an advance copy for this review, but I will be buying a copy for my keeper shelf. Beautiful book! I enjoyed reading about how the family celebrated Christmas and how Christmas celebrations changed over the years, but it was also sad how Dickens' bright youthfulness turned sour and his family life collapsed. The book is liberally illustrated with period etchings and woodcuts. Hawksley tells Dickens's story in calm prose, and doesn’t spare him from examination. His childhood poverty, his perpetual money problems (most of them created by his large family), his marital problems, are all examined. I found it a very interesting look into his life. I also liked that the author related how the celebration of Christmas was changing, due both to the Industrial Revolution and Prince Albert’s bringing German customs over to England. Hawksley weaves all the strands together well. It's packed full of interesting information about Charles Dickens. The history and traditions of the time are brought to life through writings and letters and quotes. We not only get an insight into the times and history but also into the man himself (his social reform leanings) and how his writings (especially the Christmas ones) had a profound effect on how the nation thought about Christmas. This was just a fascinating and educational read and a perfect gift for any Charles Dickens fan. Two thumbs up from yours truly. Absolutely lovely; impeccable in its research, and wonderfully warming to read. The author is a descendant of Charles Dickens which lends a special touch. This all culminated in telling a life story of an iconic British author and his impact on Christmas celebrations in England and around the world. As a longtime lover of both Dickens and Christmas, there couldn't have been a better book than this tailor-made to my interests! I love the framework of the evolution of Christmas through Dickens own personal Christmases - from childhood through to his last. I already had a good background knowledge of Dickens as a person, so the family dynamics the author delves into (Mamie Dicken's writings, Dicken's letters to friends) weren't new, but will add an interesting context for people who haven't read into that story before. A side effect of finishing this book was finding myself getting REALLY excited for this coming Christmas - all the historical info about Twelfth Cakes and decorations and games and food really made me start to anticipate my own celebrations this year! I think it would be interesting to try out some of the older English traditions discussed in this book, and have already started putting the feelers out for more books on the subject! Hawksley draws from writings by family members, letters, and the Christmas texts to create a vivid portrait of Dickens as family man, writer, and social reformer. I found Dickens at Christmas to both be entertaining and educational. The book boasts some nice illustrations and the author deserves credit for drawing attention to Dickens’s social critique which can too easily be lost in modern-day renderings of Scrooge’s personal redemption. Lucinda Hawksley is an author, broadcaster and public speaker. She has written more than twenty books, including critically acclaimed biographies, art history, social history, the history of London and travel writing. This is her third book about her great great great grandfather, Charles Dickens. Lucinda has appeared on television and radio around the globe. She is a Patron of the Charles Dickens Museum in London.